Arrow is a food processing equipment supplier and machinery manufacturer. Our products include dough sheeter systems, dough forming tools and dough feed conveyors for producers in various food sectors, including Bakery, Snacks, Confectionary, Pet Foods and Breakfast Cereal manufacturers. 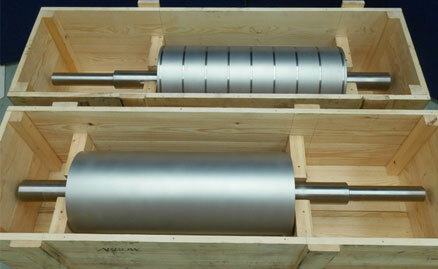 We are able to repair and upgrade most types of broken sheeting rolls. There can be a significant cost saving for the end user. We manufacture a range of cutter rolls in either bronze or plastic from 300mm to 1460mm wide including rolls with interchangeable segments. We use a dual hardness rubber construction to create resilience in the system creating a more efficient cutting performance. A key Arrow strength is our ability to either add capability or enhance existing processes. The customer may want to produce extra products on a production line to increase plant utilization. This may include increasing throughputs. Alternatively, a process may have a history of failures and break-downs. Arrow can offer customers its vast experience of plant modifications and repairs based upon many years service to Bakery and Snacks. Flat sheeted products can be enhanced by curling, corrugating or rolling. Arrow can offer solutions that retrofit to existing plant and generate new shapes from flat products. The advantages of adding equipment to existing production lines compared to dedicated sheeting systems are cost and increased plant utilization. Add a curl to a flat chip. The curling conveyor has two independent circuits – top and bottom. Product is transferred onto the bottom circuit and moves forward on the conveyor to meet the top circuit. The top and bottom circuits interlock, that is the positive profile formers on the top circuit match a reverse former on the bottom circuit. The product is now constrained and holds the shape of the profile. Convert flat chips to corrugated chips. The benefit of the ‘Wheel in – Wheel out’ machine is the creation of a second product on a flat chip line. 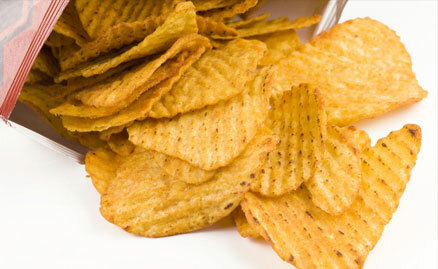 Both flat and corrugated chips can be produced on the same line. A new product is created for a low investment. 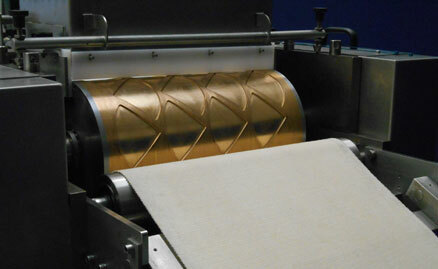 Conversion from flat to corrugated chips is easy with the ‘Wheel in – Wheel out’ machine. Roll a flat chip into a cylinder. Rolling flat chips at production rates is a difficult task made easy with the rolling rig. A ‘bolt-on’ system, the rolling rig can be installed with the minimum of plant modification. The rig will convert from flat chips to rolled chips with a simple action completed by the operator. Faster – Easier – Smarter the R&D Smart SensorTM is a multi-element system enabling the collection of 4 key baking parameters in a single pass. The user quickly gathers a complete set of profiles characterizing Environment Temp, Product Core Temp, Airflow and Energy Transfer. To collect this data using individual sensors typically requires four passes through an oven. 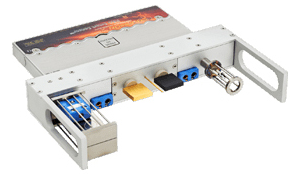 With its small footprint, only 254mm (10”) wide and only 40mm (2”) of headroom required, the R&D Smart SensorTM will pass through virtually any process. An additional sensor can be supplied to measure humidity. Space is included within the R&D transportation case for the humidity sensor making the larger system easily portable.